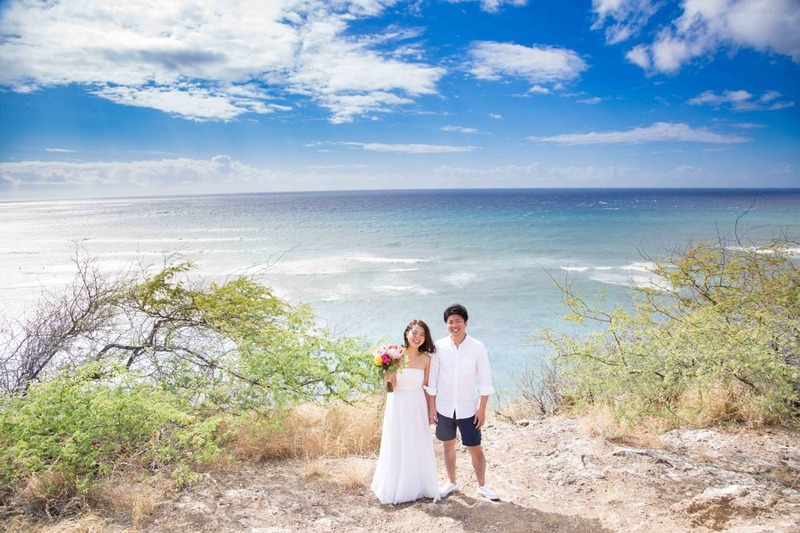 Rei and Dave decided early on they wouldn't have a ceremony nor reception and instead decided to have a special anniversary shoot in Hawaii. Hoping to save money, the couple visited many wedding and travel companies in search of a plan that would suit them. They soon realized that if they went with a wedding company or travel agency they wouldn't get to choose the shooting locations and may not like the style of the photographer included in the package. Another problem for the couple was their budget. Many travel packages and plans wouldn't fit their budget so they decided to do things on their own. 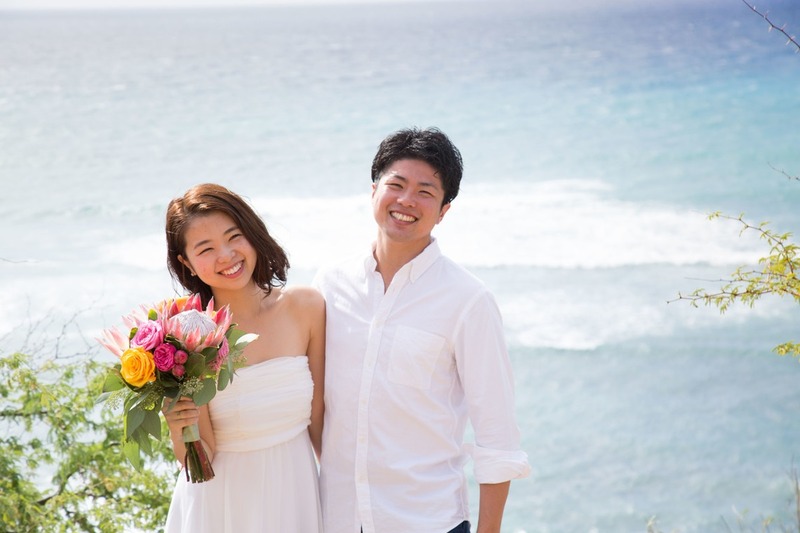 Rei and Dave learned about destination photography and hiring a local photographer through a TV show and decided to look into it more. 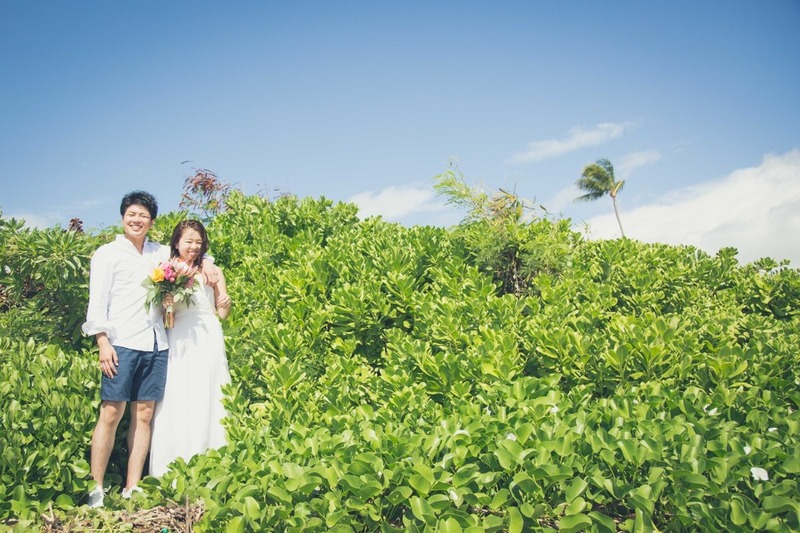 While they were searching for a photographer in Hawaii, Rei's mom had suggested Tokyo-based photographer Takano Kazuki. The couple was a bit skeptical at first. They didn't want to pay to fly the photographer all the way to Hawai'i on top of their own flight tickets and accommodations. 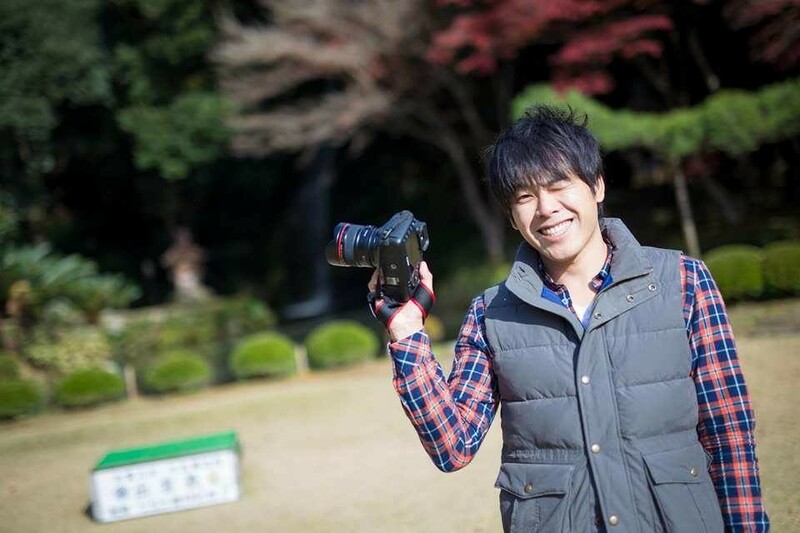 But upon asking, they found out that Kazuki was on his way to Hawai'i around the same date! 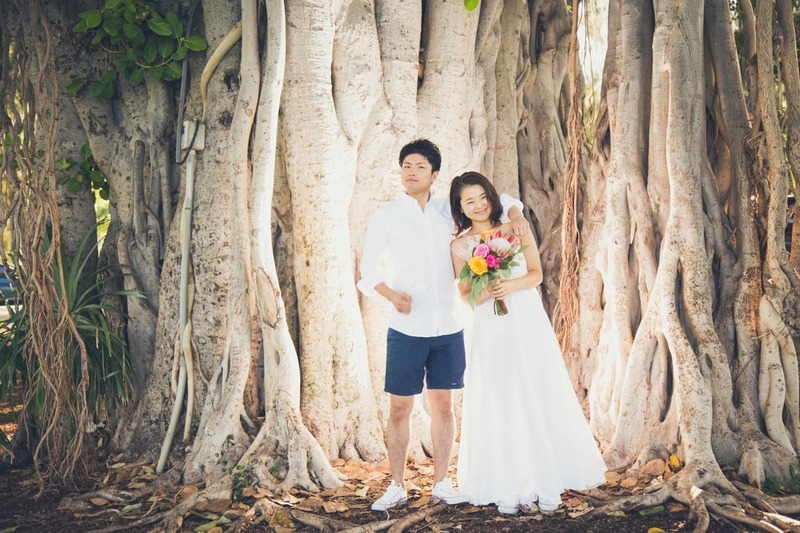 As well as the perfect timing, Kazuki's photo shoot packages were just right for the couple to manage — it was simply meant to be! We were able to meet Kazuki before our photo shoot which was really nice. Even though we still weren't decided on what we wanted our photo shoot to look like, or even the poses we'd do, we were able to discuss a lot with Kazuki. He listened intently to our requests and what we were looking for in the photo shoot. All the details like the exact meeting time/place and date were discussed via the Famarry chat system. When did you start getting your dress and accessories ready? My dress was hand made by my mother! When she heard we were having our photo shoot on the relaxing beaches of Hawai'i, she decided to design a casual and laid-back dress. As for the bouquet, I found a florist through my friend and made arrangements to pick the bouquet up the morning of the shoot. Since the dress was a very simple flowing white dress I asked the florist to make the bouquet very colorful so it could add some color to our photos. How was your photo shoot? It was great! We are all really close in age so it was like meeting a friend rather than a photographer (haha!). We were telling Kazuki how we really don't like doing poses since it feels awkward and embarrassing so he instead took a lot of candid photos of us which we really enjoyed. Having more spontaneity in our photos makes it feel more natural and not so embarrassing! We actually have a little one on the way so we are really looking forward to asking Kazuki again for a maternity photo shoot in the near future. It was really great to meet a photographer that listened so closely to our needs and was such a friend to us. Any advice for future couples? We weren't that comfortable in front of the camera to begin with so we were a bit nervous. We still don't like being in front of the camera but perhaps we've gotten a little used to it now (haha!) Photo shoots take up a fair bit of time so I think it's best to keep your schedule flexible. That way you will feel more at ease and be able to take really great photos! It's also a good idea to research the weather conditions of your photo shoot day as the date gets closer so you can make backup plans if need be. The only regret we really have is our slight weight gain from eating too much of the tasty food in Hawaii (haha)! We started at around 9 am and finished at 3 pm, having lunch together in between. First thing in the morning, we picked up our rental car and met at the hotel. The rental car really helped because we had to travel quite a bit. 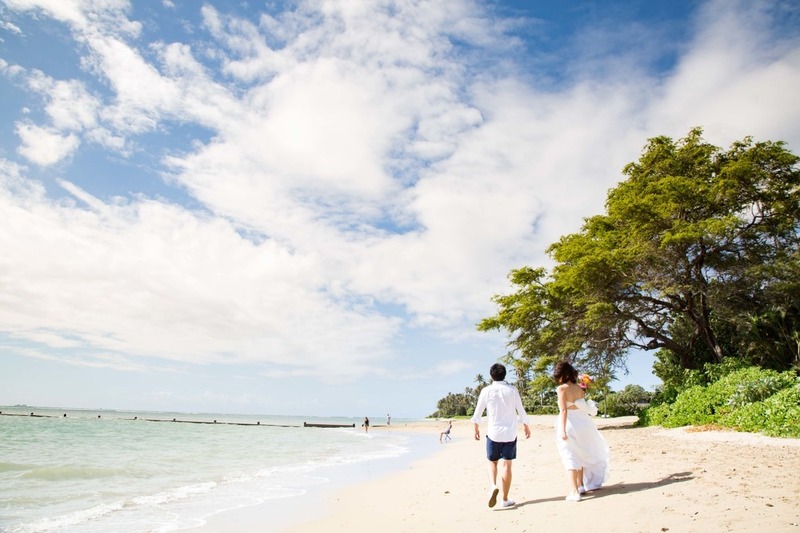 From our hotel, we drove all the way to the Kahala area for our photo shoot. Even though the shoot was about half a day, everything really went by so quickly! A very candid shot of the couple walking across the sand. "If you're shy like we are, then you should definitely try this shot too!" 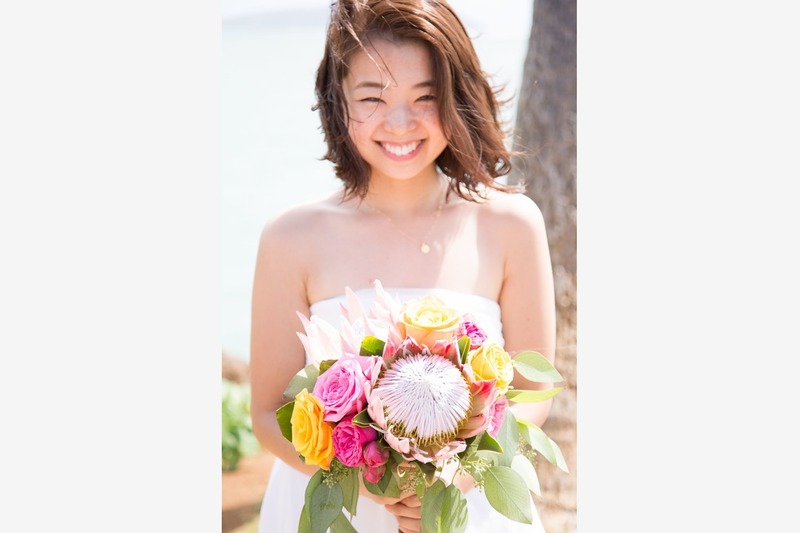 With a relaxed demeanor and beautiful smile, we see the bride with her colorful bouquet. This was the groom's favorite shot. Rei and Dave were apprehensive about doing poses so I did the photo shoot in a very photojournalistic style. It was nice, we got to talk and really just enjoy ourselves. Without really focusing on all the small details I just went with the flow occasionally calling out to them things like "Wait! just like that!" "Just talk freely, I'm not even here!" haha. The two really created a lovely atmosphere for the photo shoot themselves, I just happened to capture all the sweet moments :). I took a lot of pictures while we were driving about, that was a really great memory for me personally. To have a photo shoot in Hawai'i is really something special. I wanted to make the photos similar to vacation photos and let the couple forget that they're having a photo shoot and instead feel like they're on vacation. I'm so honored to have shared such a lovely time with them.